The Digitized wall was recently made public for those friends and relatives who are not able to visit the full wall in Washington, DC. Interactive Vietnam Veterans Memorial is available to view the names of the loved one who gave the ultimate sacrifice. 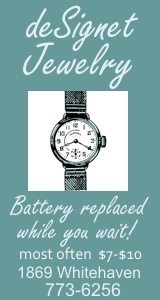 Information may be added by following directions on the site. VFW Men's Auxiliary Officers 2010-2011: President Chris McMahon, Senior Vice President Bill Derwin, Junior Vice President Gary Kratz, Treasurer Bruce Wojick Sr., Secretary Pat Patterson, Chaplain Don Tranter, Guard Steve DeMarco, Advocate Mark Gollwitzer, and Conductor Bill Brice. 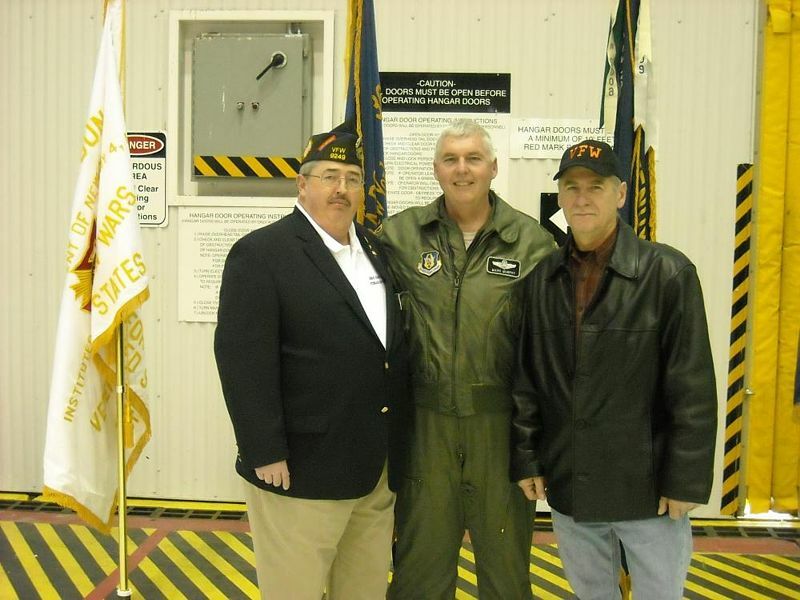 Left: VFW Color Guard with Commander Alan Lee Sr., Supervisor Peter McMahon and Chaplain Michael Rogan. 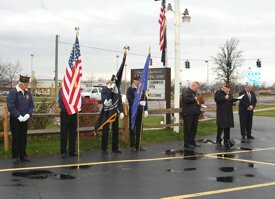 A remembrance service was held on Wednesday, December 7th to honor Pearl Harbor Day - "A day that will live in infamy." The Charles N. DeGlopper Memorial VFW Post #9249 hosted the event, and units of the Disabled American Veterans, the American Legion and the Veterans of Foreign Wars were also in attendance. Wednesday, December 7th is Pearl Harbor Day - "A day that will live in infamy." 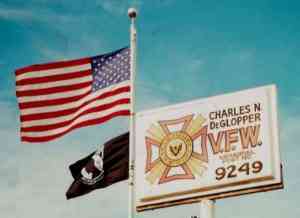 A memorial service is being held at the Charles N. DeGlopper Memorial VFW Post #9249 flag pole at noon. Taking part will be the Island units of the Disabled American Veterans, the American Legion and the Veterans of Foreign Wars. Dinner includes open faced hot turkey sandwich and gravy, with vegetable and cranberry sauce and slice of apple pie..
Also available will be 50/50 drawing and lottery tree. Pictured are winners Pat Doyle who stood in for his sister, Kathy Hillman, Sarah Kielaszek and Tony Majewicz. 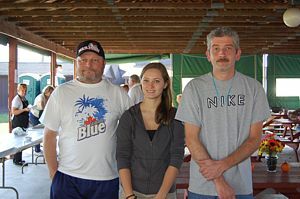 VFW Post #9249 held its annual chili cookoff contest Saturday, October 8. It was not an easy job for judges Supervisor Peter McMahon, Councilman Gary Roesch and Kelly Carrigg, junior vice commander of post 9249. After a lot of tasting the many pots of chili, judges came up with the three winners. They are Kathy Hillman - first place, Tony Majewicz - second place, and Sarah Kielaszek - third place. Iron Mike Wounded Warrior Bike Ride is complete. The Mike Mehltretter's completed their ride for Wounded Warriors this morning (Thurs., Sept. 15, 2011) at the department (state) headquarters of the Veterans of Foreign Wars at 69 Sand Creek Road, Albany. Past Department Commanders Art Koch, III and Hal Burke were on hand to greet Mike and Mike. Their ride began Sunday, September 11th from the Niagara Falls Air Base. Their over night stops included VFW posts in Brockport, Hinsdale, Mattydale, Amsterdam and finally the VFW Headquarters. See below for more details. The VFW 9249's Annual Chili Cook-Off will take place on Saturday, October 8th at 4 p.m. at the post, 2121 Grand Island Blvd. Activities will include kids' games and live music/"open mic" featuring local area musicians. Registration is $10 .Entries for the cook-off will be accepted at the VFW Post prior to the event or from 2-3 p.m. the day of cook-off. Prizes for 1st, 2nd and 3rd place are $100.00, $50.00 and $25.00. 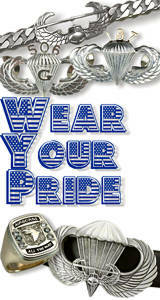 For more information, call the VFW Post at 773-6343. What started as a Father & Son Trip has become The First Annual Iron Mike Wounded Warrior Bike Ride. The ride will be starting out on Sunday Morning, September 11th. It will begin at the Niagara Falls Air Base's 'Thunder of Niagara' Air Show and head East making its way to the new VFW State Headquarters in Albany. The cyclists will be taking the State Bicycling Route 5 which is mostly along the Erie Canal, with stops at VFW Posts along the canal, to meet with fellow veterans and fund raise. Participants will be passing through downtown Rochester and Northern Syracuse, and are hoping people will meet them along the way to ride for the day. You will be able to follow their progress via Facebook (http://www.facebook.com/IronMikeWWRide) and Twitter (http://twitter.com/#!/IronMikeWWRide). We the people borrowed the money for 10 years of war and asked 1 percent to serve. It's time for regular people to help those who gave so much! 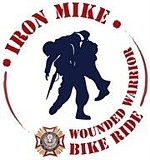 IRON MIKE WOUNDED WARRIOR BIKE RIDE, help us help them. Donate to our cause. All donations can be sent to the Charles N. DeGlopper Memorial VFW Post #9249 2121 Grand Island Boulevard, Grand Island, NY. Please make checks payable to: �VFW Post 9249� memo: �Wounded Warrior: Iron Mike� 100% of the donations will be passed along to the Wounded Warrior Project. Post Commander Alan Lee, Winner Thomas Kalman, Ladies Auxiliary President Laura Sexton, and Men's Auxiliary President Chris McMahon. 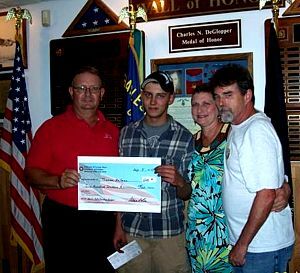 Charles N. DeGlopper Memorial VFW Post 9249�s 2011 Scholarship award was presented to Thomas S. Kalman, grandson of the late Louis Kalman, a Veteran and former member of Post 9249. Tom�s essay, based on a patriotic theme, was judged the best of the entries received. Thomas is the son of Laurie Kalman and Scott Kalman, both of Grand Island and will be attending Alfred State College this year. The Veterans of Foreign Wars annually presents a scholarship to a graduating senior, based on the Patriotic essay. The 2012 essay theme will be announced in the scholarship program booklet issued by the Grand Island High School Guidance Department early in 2012. 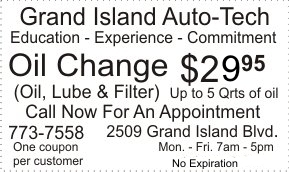 The scholarship award is open to all Grand Island High School seniors. Jessica Ackendorf, a high honor roll student entering her freshman year at Grand Island High School in September entered the Patriot's Pen Essay competition at the middle school level. Her entry was submitted and judged with 80+ others at the Post level then advanced through the County, District and Department (state) levels to finish in 6th place. 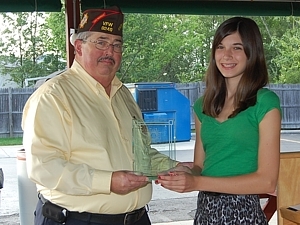 Jessica is shown with Dan McMahon, commander of the Erie County Council Veterans of Foreign Wars and member of the local VFW #9249, who presented her with a trophy and a US savings bond in the amount of $4000 to be used towards her college education. Another Grand Garage Sale takes place at the Charles N. DeGlopper VFW Post 9249 at VFW 9249, 2121 Grand Island Blvd., Grand Island, NY 14072. All are welcome to come set up a table. A picnic table under the pavilion is $20.00. Lawn sites are $10.00 - with your own table and tent of choice. The Grand Island VFW #9249 Men's Auxiliary will present its 3rd Annual Acoustic Night Open Mic from 7 p.m. to ? on Friday, July 22 in the Pavilion, 2121 Grand Island Blvd. The event is a fundraiser to help provide a baseball experience on Grand Island for mentally/physically disabled children players. Admission is free and the event features a cash bar, food available, raffles and 50-50s. Performers must sign up by July 15 by calling Mark, 773-3058; Steve, 990-6976; or Pat, 472-3148. 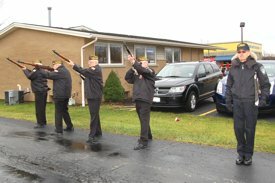 The installation of the 77th Annual Erie County Council Veterans of Foreign Wars took place Saturday, May 21, 2011 at the VFW Convention at VFW Post 8113 in West Seneca, NY. Installed were Commander Daniel McMahon, Quartermaster Richard Lozo and Trustee Alan Lee of Grand Island and Trustee Kelly Carrigg. Ladies Auxiliary President Susanne McMahon was also installed. Unable to attend the installation were Auxiliary officers Junior Vice President Kathy Blake and Assistant Guard Molly McMahon. 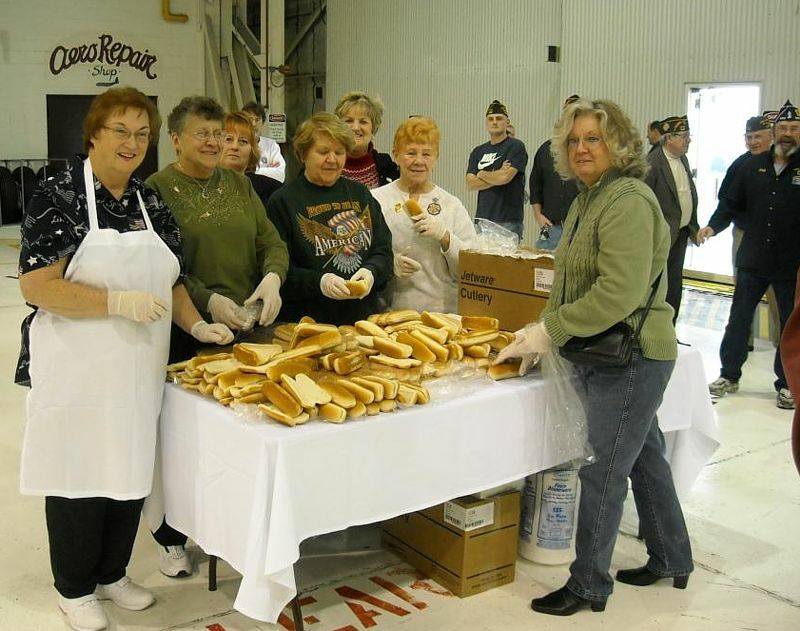 The Charles N. DeGlopper Memorial VFW Post 9249 Ladies Auxiliary will host a Spaghetti Dinner from 4-7 p.m. Saturday, February 26th at the post, 2121 Grand Island Blvd. Cost is $6 and includes bread and salad. Desserts will be available. 50/50 Raffle and Money Tree. 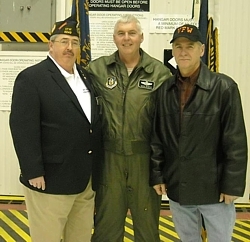 Erie County Council VFW Commander Dan McMahon Commander (Life and local VFW member), Col Mark Murphy, USAF (Life and local VFW member), David Czarnecki, Commander District 6 Department of New York VFW. Members of 914th Air Reserve Wing, on Saturday, January 8, deployed for a tour in the Middle East. 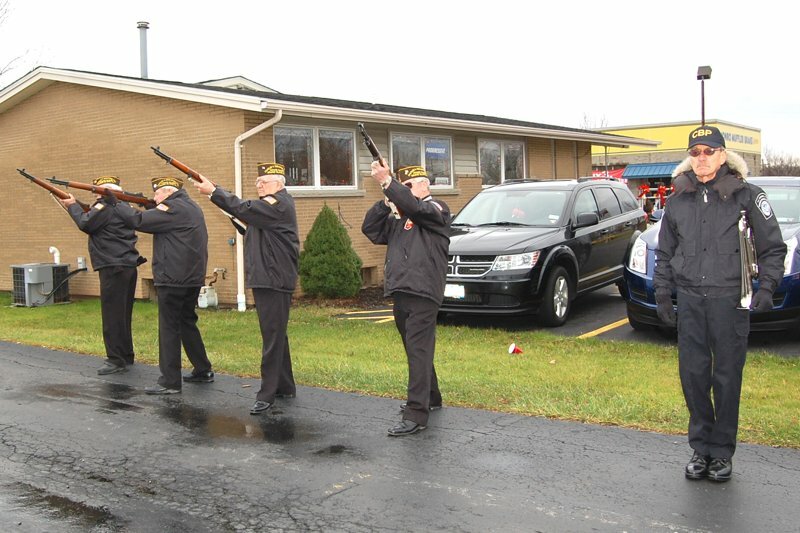 Members of the Veterans of Foreign Wars and their Ladies and Men�s Auxiliaries went to the Niagara Falls Air Base for the departure. 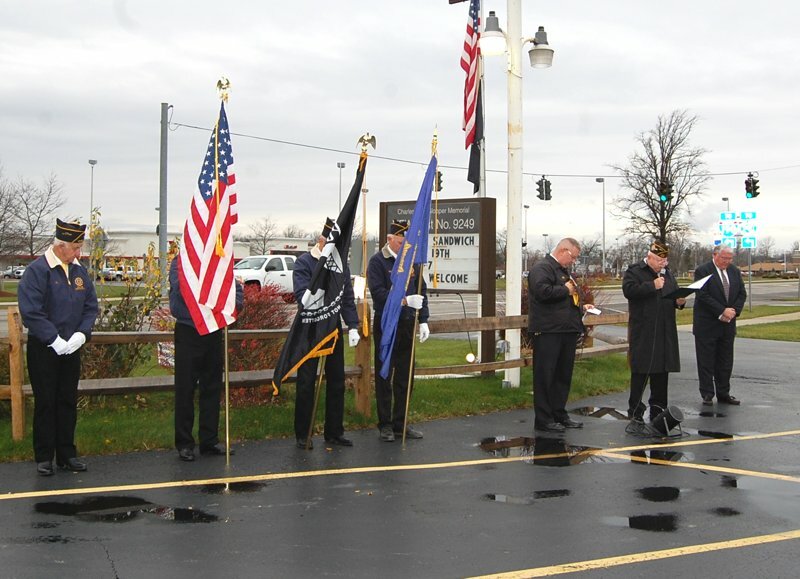 What started as a phone call to the Commander of the Erie County Council Veterans of Foreign Wars, Dan McMahon ended with a send off rarely seen in Western New York. Col. Mark Murphy, USAFR acting 914th Wing Commander, called Mr. McMahon to ask if there wasn�t something which could done for the soon to deploy members of the 914th Air Wing from Niagara Falls. "It was suggested we put on a BBQ for the some 300 Air Force personnel and their families," McMahon said. Phone calls and emails were exchanged for the next few days to the National Headquarters of the Veterans of Foreign Wars and the various Veterans organizations throughout Erie County. "We needed to raise enough money and manpower to take care of the needs of the families and personnel for the day," he said. After enough commitments were received, Dan notified Col. Murphy that the task could be handled as requested. 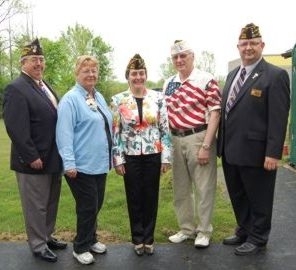 Donations were received from National VFW Headquarters� M.A.P. 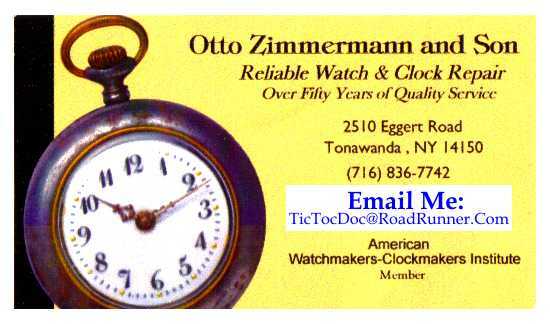 Program, Erie County American Legion, VFW Posts 9249, 205, 1419, American Legion Posts 362 & 1346, D.A.V. Chapter #168, East Aurora Chapter Viet Nam Veterans, and Ladies Auxiliaries of Post 1488 and 9249. Vital information about benefits and contact information was provided to deploying personnel and their families. The Veterans and Auxiliaries served dinner to all as their way to thank them for their service. As the busses arrived, the Veterans provided an honor guard and salute to those leaving for duty.